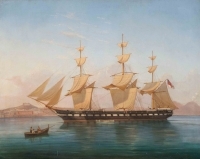 Tomaso de Simone was a Neapolitan port painter who painted numerous high-quality ship portraits from the 1820's onwards. His work is notable for its high quality of execution, bright palette and attention to maritime detail – an essential trait for an artist whose principle clients were naval officers. The present example if typical of his output during his years of maturity, and may be taken as a highly accurate depiction of one of the most famous British ships of the 19th century. He also created scenes of the Battles of Lissa (1867) and Alexandria (1882). Simone worked for numerous naval officers, including a substantial number of visiting American officers during the years of the Civil War. He was the father of the highly prolific Antonio de Simone (1851-1907), who continued the family tradition of ship portraiture, albeit of a more pedestrian quality..
HMS Arethusa3 was the fifth British royal navy ship to bear the name. A 50-gun 4th rate wooden hulled frigate, she was launched at Pembroke Dockyard on 20th June 1849. Arethusa was an all-wooden construction, and the last major ship of the Royal Navy to enter an engagement under sail power only, when she was in action at the bombardment of Odessa (21st April 1854) and Sevastopol (17th October 1854) under the captaincy of (Sir) William Robert Mends, GCB (27 February 1812 – 26 June 1897). The bombardment of Sevastopol was not a success: the allied fleet suffered more damage that the defending forts and batteries. Vice-Admiral Dundas's dispatch concerning the engagement is laconic – some would say very meagre. It declares briefly that the Agamemnon, Sans Pareil, Samson, Tribune, Sphinx, and Lynx, and the Albion, London, and Arethusa, towed respectively by the Firebrand, Niger, and Triton, "engaged Fort Constantine and the batteries to the northward"; and that the other sailing ships, with a steamer lashed on the port side of each, "gradually took up their positions, as nearly as possible as marked on the plan" appended to the letter; that the action lasted from about half-past one to half-past six P.M.; that the British ships had lost 44 killed and 266 wounded; and that - "The ships, masts, yards, and rigging are more or less damaged, principally by shells and hot shot. The Albion has suffered much in hull and masts; the Rodney in her masts, she having tailed on the reef, from which she was got off by the great exertions of Commander Kynaston, of the Spiteful, whose crew and vessel were necessarily exposed in performing this action; but, with the exception of the Albion and Arethusa, which ships I send to Constantinople to be repaired, I hope to be able to make my squadron serviceable in twenty-four hours." In truth, the marshalling of the large fleet bordered on the shambolic, since the shallow waters precluded their easily taking up bombardment post at a close distance when more effective execution would have taken place. The allied admirals merit censure for not establishing this simple fact in advance and communicating it firmly to Lord Raglan; the allied captains equally merit praise for their endeavours in trying conditions to which they should surely not have been ordered. The distance (typically 2000 yards) from the fort rendered the attackers' cannon balls relatively innocuous to the thick walls of the defensive batteries, whilst as similar range the defenders' shot wrought havoc with the ships which were their targets. The Arethusa was quite badly mauled by the Russian shore batteries, having had her rigging cut to pieces, many shot in her hull, and 23 persons (including 5 of the Triton's, who were helping to serve her guns) killed and wounded, she was presently towed out of the action by her attendant. It was, though, conceded by all those present that she had more than done her duty. She returned to Constantinople (Istanbul), the capital of the Ottoman Turk allies, for repair and re-fitting on 21st October, returning thence on November 12, arriving in Malta on the 25th and ultimately in Plymouth on 3rd January 1855 when she was paid off. In 1861, the ship was modernised by the inclusion of screw propulsion, though she remained a fully rigged ship.After refitting as a screw-frigatshe measured: Displacement: 3,708 tons ; burthen: 3,142 tons 33⁄94. Length: 252 ft 4 in (76.91 m) (gundeck) 217 ft 1 in (66.17 m) (keel); Beam:52 ft 8 in (16.05 m); Draught: 20 ft 8 in (6.30 m) (forward) 23 ft 6 in (7.16 m) (aft). Depth of hold:17 ft 1 in (5.21 m). Installed power: 3,165 ihp (2,360 kW). Propulsion: Trunked engine, with surface condensers. Cylinders 80in diameter and 42in stroke. Sail plan:Full rigged ship. Speed:11.704 knots (21.68 km/h; 13.47 mph) . Crew: 525. Armament Middle deck: 30 × 8in shell; Upper deck: 20 × 32-pounders + 1 × 68-pounder on pivot. The ship's figurehead, originally carved by the Hellyer family, has been preserved and remains on exhibit at Upnor on the Medway. It was recently restored by Maritima wood-carving. In 1873 at the end of her useful life the Royal Navy sold Arethusa to be converted into a Training Ship for boys. She was moored in the Thames at Greenhithe, between Dartford and Gravesend. She was finally towed away for breaking in 1933 at Charlton, after 84 years' service. 3 As a sailing ship Arethusa was a Constance-class frigate of 2,125 Tons burthen 75⁄94. Length: 180 ft (55 m) (gundeck) 146 ft 10.25 in (44.76 m) (keel) Beam:52 ft 8 in (16.05 m). Depth of hold:16 ft 3 in (4.95 m). Sail plan: Full rigged ship. Crew:500. Armament: Upper deck: 28 × 32-pounders (10 × 32-pounders later replaced by 10 × 8in/68-pounder shell guns) Quarterdeck: 14 × 32-pounders Forecastle: 8 × 32-pounder.